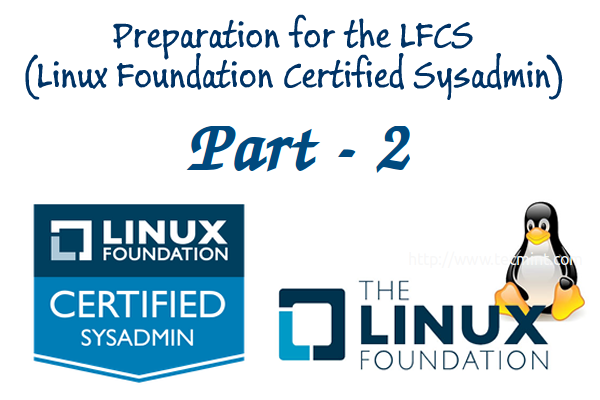 A couple of months ago, the Linux Foundation launched the LFCS (Linux Foundation Certified Sysadmin) certification in order to help individuals from all over the world to verify they are capable of doing basic to intermediate system administration tasks on Linux systems: system support, first-hand troubleshooting and maintenance, plus intelligent decision-making to know when it’s time to raise issues to upper support teams. Please take a look at the below video that explains The Linux Foundation Certification Program. This post is Part 2 of a 10-tutorial series, here in this part, we will cover the basic file editing operations and understanding modes in vi/m editor, that are required for the LFCS certification exam. Vi was the first full-screen text editor written for Unix. Although it was intended to be small and simple, it can be a bit challenging for people used exclusively to GUI text editors, such as NotePad++, or gedit, to name a few examples. To use Vi, we must first understand the 3 modes in which this powerful program operates, in order to begin learning later about the its powerful text-editing procedures. Please note that most modern Linux distributions ship with a variant of vi known as vim (“Vi improved”), which supports more features than the original vi does. For that reason, throughout this tutorial we will use vi and vim interchangeably. 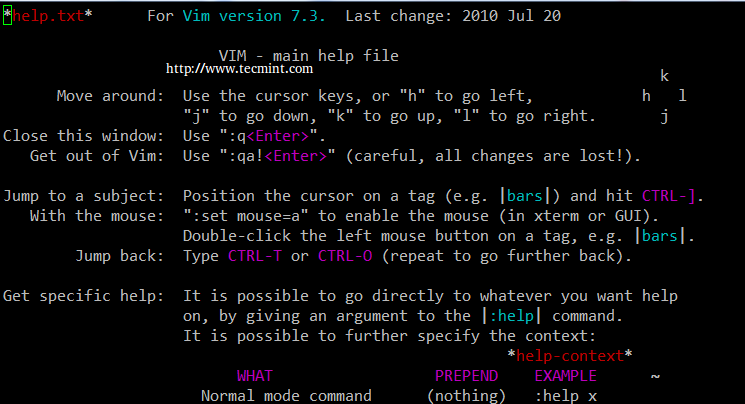 If your distribution does not have vim installed, you can install it as follows. Why should I want to learn vi? There are at least 2 good reasons to learn vi. 1. vi is always available (no matter what distribution you’re using) since it is required by POSIX. 2. vi does not consume a considerable amount of system resources and allows us to perform any imaginable tasks without lifting our fingers from the keyboard. In addition, vi has a very extensive built-in manual, which can be launched using the :help command right after the program is started. This built-in manual contains more information than vi/m’s man page. To launch vi, type vi in your command prompt. Then press i to enter Insert mode, and you can start typing. Another way to launch vi/m is. Which will open a new buffer (more on buffers later) named filename, which you can later save to disk. 1. In command mode, vi allows the user to navigate around the file and enter vi commands, which are brief, case-sensitive combinations of one or more letters. Almost all of them can be prefixed with a number to repeat the command that number of times. For example, yy (or Y) copies the entire current line, whereas 3yy (or 3Y) copies the entire current line along with the two next lines (3 lines in total). We can always enter command mode (regardless of the mode we’re working on) by pressing the Esc key. The fact that in command mode the keyboard keys are interpreted as commands instead of text tends to be confusing to beginners. 2. In ex mode, we can manipulate files (including saving a current file and running outside programs). To enter this mode, we must type a colon (:) from command mode, directly followed by the name of the ex-mode command that needs to be used. After that, vi returns automatically to command mode. 3. In insert mode (the letter i is commonly used to enter this mode), we simply enter text. Most keystrokes result in text appearing on the screen (one important exception is the Esc key, which exits insert mode and returns to command mode). The following table shows a list of commonly used vi commands. File edition commands can be enforced by appending the exclamation sign to the command (for example, <b.:q! enforces quitting without saving). U Undo the last command in the last line. This will work as long as the cursor is still on the line. :n Next file; when multiple files are specified for editing, this commands loads the next file. :e file Load file in place of the current file. :q Quit without saving changes. :w file Write the current buffer to file. To append to an existing file, use :w >> file. :r! command Execute command and insert output after (next line) the current cursor position. The following options can come in handy while running vim (we need to add them in our ~/.vimrc file). set number shows line numbers when vi opens an existing or a new file. syntax on turns on syntax highlighting (for multiple file extensions) in order to make code and config files more readable. set tabstop=4 sets the tab size to 4 spaces (default value is 8). set autoindent carries over previous indent to the next line. vi has the ability to move the cursor to a certain location (on a single line or over an entire file) based on searches. It can also perform text replacements with or without confirmation from the user. a). Searching within a line: the f command searches a line and moves the cursor to the next occurrence of a specified character in the current line. For example, the command fh would move the cursor to the next instance of the letter h within the current line. Note that neither the letter f nor the character you’re searching for will appear anywhere on your screen, but the character will be highlighted after you press Enter. For example, this is what I get after pressing f4 in command mode. b). Searching an entire file: use the / command, followed by the word or phrase to be searched for. A search may be repeated using the previous search string with the n command, or the next one (using the N command). This is the result of typing /Jane in command mode. c). 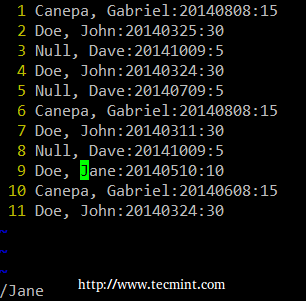 vi uses a command (similar to sed’s) to perform substitution operations over a range of lines or an entire file. To change the word “old” to “young” for the entire file, we must enter the following command. Notice: The colon at the beginning of the command. The colon (:) starts the ex command, s in this case (for substitution), % is a shortcut meaning from the first line to the last line (the range can also be specified as n,m which means “from line n to line m”), old is the search pattern, while young is the replacement text, and g indicates that the substitution should be performed on every occurrence of the search string in the file. Alternatively, a c can be added to the end of the command to ask for confirmation before performing any substitution. Before replacing the original text with the new one, vi/m will present us with the following message. a: perform the substitution in this and all subsequent instances of the pattern. q or Esc: quit substituting. l (lowercase L): perform this substitution and quit (last). Ctrl-e, Ctrl-y: Scroll down and up, respectively, to view the context of the proposed substitution. 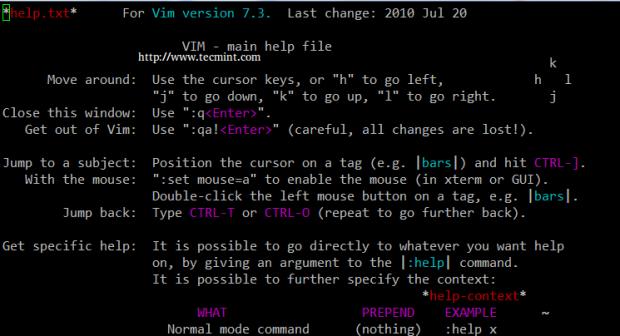 Let’s type vim file1 file2 file3 in our command prompt. First, vim will open file1. To switch to the next file (file2), we need to use the :n command. When we want to return to the previous file, :N will do the job. In order to switch from file1 to file3. a). The :buffers command will show a list of the file currently being edited. b). The command :buffer 3 (without the s at the end) will open file3 for editing. In the image above, a pound sign (#) indicates that the file is currently open but in the background, while %a marks the file that is currently being edited. On the other hand, a blank space after the file number (3 in the above example) indicates that the file has not yet been opened. 1. Press the ESC key to be sure we are in vi Command mode. 2. Place the cursor on the first line of the text we wish to copy. 3. Type “a4yy” to copy the current line, along with the 3 subsequent lines, into a buffer named a. We can continue editing our file – we do not need to insert the copied lines immediately. Type “ap to insert the lines copied into buffer a after the current line on which the cursor is resting. Type “aP to insert the lines copied into buffer a before the current line. If we wish, we can repeat the above steps to insert the contents of buffer a in multiple places in our file. A temporary buffer, as the one in this section, is disposed when the current window is closed. 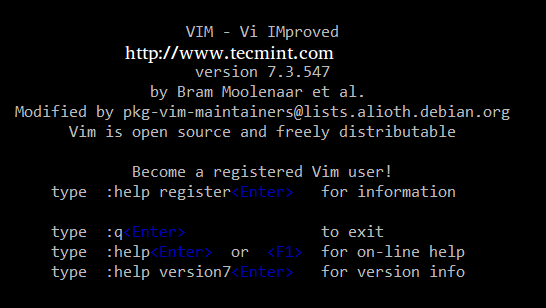 As we have seen, vi/m is a powerful and versatile text editor for the CLI. Feel free to share your own tricks and comments below. Why get a Linux Foundation Certification? Update: If you want to extend your VI editor skills, then I would suggest you read following two guides that will guide you to some useful VI editor tricks and tips. One fun workaround with vim that I use sometimes is that if you’ve forgotten that you can’t write to the file you’re editing unless you’re root, you can use the command “:w !sudo tee %” to execute the write with sudo permissions. This only works if you’re in the sudo group on the machine, but it’s helped me several times when I’ve edited system files and forgotten to open the file with sudo or as root. Great guide for novices. Thanks. What a wonderful and helpful page for LFCS. I’m taking the LFCS in about three days and despite all the discouraging post online about this certification, I will still take my chances. I think your tutorial is the best yet to prepare for this exam. Thank you for your kind words. Please keep in mind that this guide is not updated to cover all of the domain and competencies listed in the latest revision of the LFCS exam (https://training.linuxfoundation.org/images/pdfs/LFCS_Domains_Competencies_V2.16.pdf), but the LFCE series (also featured here in Tecmint.com) is a good complement and great source of materials until we update the LFCS. On a side note, what are the discouraging posts you are referring to? kindly tell me how can i gain this article part 1 ? Here is the link to the part 1 of this series..
Do I really have to learn vim ? Can I get by on this exam with just nano ? You can use whatever text editor you feel most comfortable with. In this series we choose vi/m because vi is present out-of-the-box on all distros and tends to be the tool of choice for most people. That being said, feel free to use whatever editor you want during the exam, as long as you find it installed on the virtual machine that they give you, but nano should be installed as well by default. It will immediately enter Insert mode, right? It should. Did you try it yourself in practice? Please post back if the behavior is not as expected. Hi Gabriel! Thank you for this great series of articles for the LFCS! I think what @lvin may be getting at here is that one cannot yank four lines into register “a” (I’ll also highlight that a few of the steps above refer to this as a “buffer”, which is slightly inaccurate terminology) as outlined above, or really any character that has a special function within vi/vim, since said key is going to go enter “insert” mode. Rather, something like “04yy” and/or “0p” to illustrate use of register “0” might be a better example, although feel free to let me know if I’m missing something. In any case, thanks again for the great write-up, Gabriel! You both appear to have misunderstood what he wrote. The author was not surrounding a4yy with quotes. Thank you @lvin and @Barry for pointing this out, and mdebusk for clarifying. @Ravi, please correct the writeup as suggested by mdebusk above. Corrected as suggested in the writeup, I hope it will clear any confusion..
That indicates that aptitude is not present on your system. and then start enjoying the bounties of one of the most powerful package management systems out there ;).